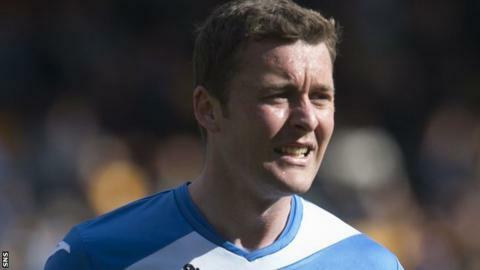 Scobbie describes Dundee United as "a great club with fantastic support"
Dundee United have signed former St Johnstone defender Tam Scobbie after his contract expired at McDiarmid Park. Scobbie, 29, has signed a two-year deal with the Championship outfit after five years in Perth. "I am excited to join United. It is a great club with fantastic support," Scobbie told United's official website. "When I spoke to the manager [Ray McKinnon], I knew this was where I wanted to sign and I am delighted to have my future secured." Scobbie is United's third summer signing, following the arrivals of James Keatings and Billy King on pre-contracts agreements. "Thomas is an excellent defender who can play both left-back and central, and he will enhance our defensive options," said the United boss. "As important, he is also a great organiser, a real leader with plenty of experience and these are vital characteristics for me. "We need to add more players, and I expect to further add to the squad before pre-season begins."